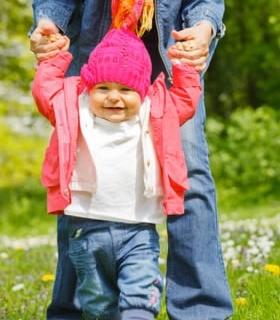 When babies are first learning how to walk, it is better for them to go barefoot or to wear booties. Shoes should fit well, have non-skid soles, and be lightweight and flexible. More experienced walkers will need a thicker sole once they start walking outside. Baby shoes are adorable, but until your baby really starts cruising, socks or booties are your best choice. When babies start to take those first few steps, they need to be able to feel their feet on the ground to develop a sense of balance. Shoes that are too stiff or heavy will restrict natural foot movement. Your best bet is to let your baby go barefoot or to buy booties with non-skid bottoms for cold days. Don’t come off easily, but are also not too tight. You don’t want a shoe that pinches or constrains the foot. Aren’t slippery. Make sure the sole provides a good amount of traction. Are flexible. You want your baby to be able to feel the movement of their feet against the ground. Are made out of breathable material. Nobody wants stinky, sweaty feet! Once your baby becomes a more experienced walker, you will want a shoe that does a better job of protecting the foot when walking outside. Sneakers are usually a good choice because they mold to your child’s foot, don’t slip off easily, and provide stability. Closed-toe shoes are also a good idea because at this age toddlers are still prone to tripping. Kids outgrow shoes quickly at this age, so you really don’t need to invest in expensive shoes. You are fine getting inexpensive shoes that fit well.